Good for the Boar and great for us humans. Although this is fantastic news for the boars. Experimental is another word for trial, so I hope that Kevin Stannard will follow through with his kind proposals and make this closed season manditory every year, to protect the adult and juvenile boars while they are at their most vulnerable. This is a massive step forward and I welcome all proposals put forward. Many thanks to all who have supported this cause. The Boar have as much right to be here as we if not more. If we leave them alone and keep dogs away from them they will more than likely leave us alone. By rooting around they bring dormant plants to life. Great to see the Boar gaining acceptance. I look forward to the day when we have them here in the New Forest. They will need management though, folks are going to have to get used to that idea. Are you all mad? Do predators give their prey the Summer off for humane reasons? Will the Boar without legal culling, not just be targeted by increased poaching activities? Without being culled will the boar just increase unchecked and become tame around humans, like the Grey Squirrel population in the Dean? If the boar are not already at carrying capacity, their productivity will remain high, until all available suitable habitat is in use. At this point the population will level out and productivity will decline. This is fine, if the Dean was an island, but it is surrounded by the rest of the UK. This country has not the wild space for the boar to become widespread and common. The Dean and other large forest areas may be able to hold small, sustainable populations. But it is unfair on the rest of the country to be forced to live with this species outside of these areas. 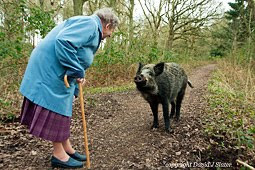 We only need to look at the wildboar issues in Europe's urban environments, to see that we are not fit to have a countrywide population of boar again. Thanks for all your comments folks. We shall put up a new post soon explaining a little more about how we see boars living alongside humans in the Forest, and hopefully answer Forest Imp's natural concerns. 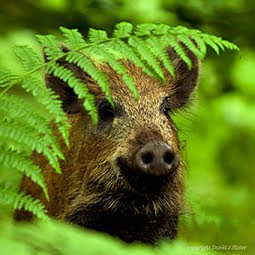 Wild Boars – Our Hopes for 2012.